The Biz Latin Hub team accompanied by the Ambassador for New Zealand and UK Trade Commissioner. Ecuador and Mexico. 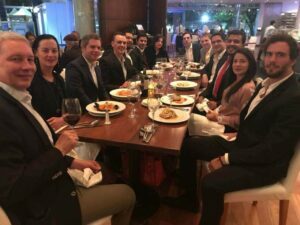 The team kicked off proceedings with a formal dinner at Cafe Renault as they were joined by their guests Lucy Duncan, New Zealand Ambassador to Colombia and Ramin Hassan, UK Trade Commissioner to Colombia. Discussions during the dinner revolved around the positive outlook for the Latin American economy and how both the UK and New Zealand can strengthen their ties with the LATAM region and increase trade. They also discussed how Biz Latin Hub are seeking to increase collaboration with embassies and chambers of commerce as they assist foreign firms to penetrate Latin American markets. With offices in key locations across the LATAM region, Biz Latin Hub is in a unique position to support foreign firms as they enter the market through the provision of their tailored, professional and bilingual back-office services. “We strongly believe in the synergies and benefits for the Biz Latin Hub Group to work in partnership with Embassy Trade Departments in order to cooperatively offer market entry and back office solutions for clients looking to enter the Latin American Market. Throughout 2018 we aim to continue to foster and develop our already strong relationships within the different embassies and trade missions across the region. We are expecting a strong 2018 focused around growth in revenue and relationships”, said Craig Dempsey, founder and CEO of Biz Latin Hub. During the rest of the three-day group meeting, the Biz Latin Hub team held conferences about the company’s achievements over the past year as well as business objectives and priorities for the coming years with a focus on continuing the group’s expansion throughout the region. Of particular note, during the meeting Biz Latin Hub welcomed a new country manager to the team, Ernesto Terán, who is now leading the Ecuador office. Biz Latin Hub is seeking to further grow its Ecuador office in 2018 as part of its regional expansion.